The Fergusons are on top of the world with their “baby” Rockville finally having hit the screens. THERE’S been a lot of hype about the new local series Rockville that’s just started airing on DSTV’s Mzansi Magic and it seems set to turn its creators into even bigger power players in the local entertainment industry. 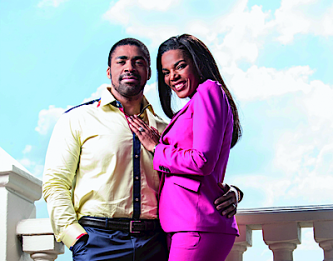 Mzansi’s favourite soapie couple, Connie and Shona Ferguson, seem to have cracked the big league and their production house, Ferguson Films, is doing very well. DRUM met up with the busy pair at the upmarket Joburg hotel 54 on Bath in Rosebank, to find out more about Rockville. And like the professionals they are, they’re right on time. After exchanging hugs and greetings, we all troop into the lift and slot in the room key card to get to the 10th floor. Shona suddenly breaks into a huge grin and is quick to share the joke. “We shot a few scenes for Rockville here and we got stuck in this very lift,” he says. “I didn’t realise you had to take the room key card with you to operate the lift, so Kenneth Nkosi and Trevor Gumbi – who were shooting some scenes for Rockville – and us got stuck in the lift.